Entertain up to 200 people in our exclusive event space on the first floor of Liverpool most iconic building. Unrivalled panoramic views across the Mersey lend to the magic of a true Christmas celebration, providing your guests with an unforgettable experience. Dine, drink and dance all under one roof with our fully inclusive range of packages offering catering, drinks, staffing and entertainment. Our capable team will assist through the planning of your event and will be on hand on the night so you can relax and enjoy the party. For Christmas 2018 The Venue at the Royal Liver Building will be transformed with exquisite decor into a ‘White Wonderland’ theme, visually stunning yet subtle enough to and enhance your own bespoke event theme. An elegant colour scheme has been designed to complement this contemporary event space, with intricate features completing the look. 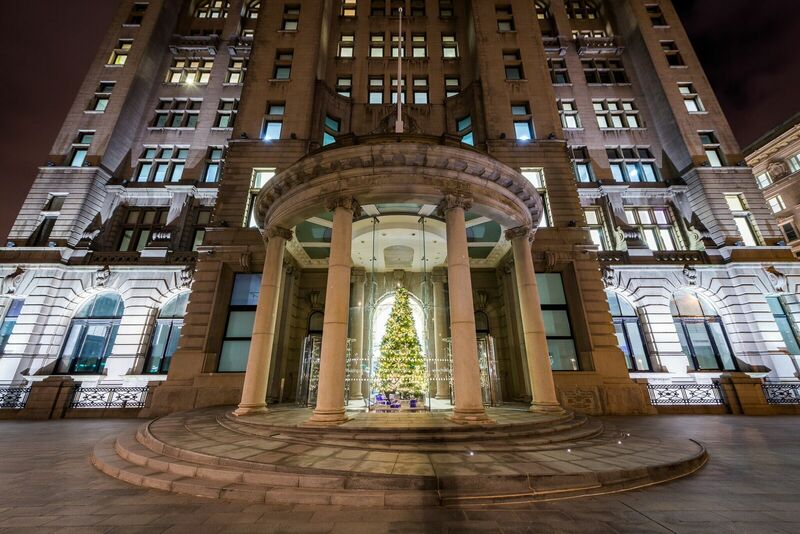 The traditional Christmas tree gets a contemporary Royal Liver Building twist,with sparkling decorations, icicles, snowflakes and glass baubles. This year’s theme brings together elements from modern and classic design, for a timeless effect which transports guests to a magical space. To truly take all the hassle out of planning your event you can take advantage of our range of fully inclusive packages, incorporating catering, drinks, staff and entertainment. With panoramic views, excellent service and sumptuous catering The Venue is the perfect party space for your unforgettable Christmas Party. Dance the night away before the glittering lights of Liverpool this winter, and treat your guests to a Christmas celebration like no other. Dates are booking up fast so be sure to Contact us soon to book your unforgettable Christmas Party. Visit royalliverbuildingvenue.co.uk/christmas to view our packages.